I’m trying to read the fiction of Katharine Susannah Prichard at least roughly in order, but of course that’s never as straightforward as it sounds. 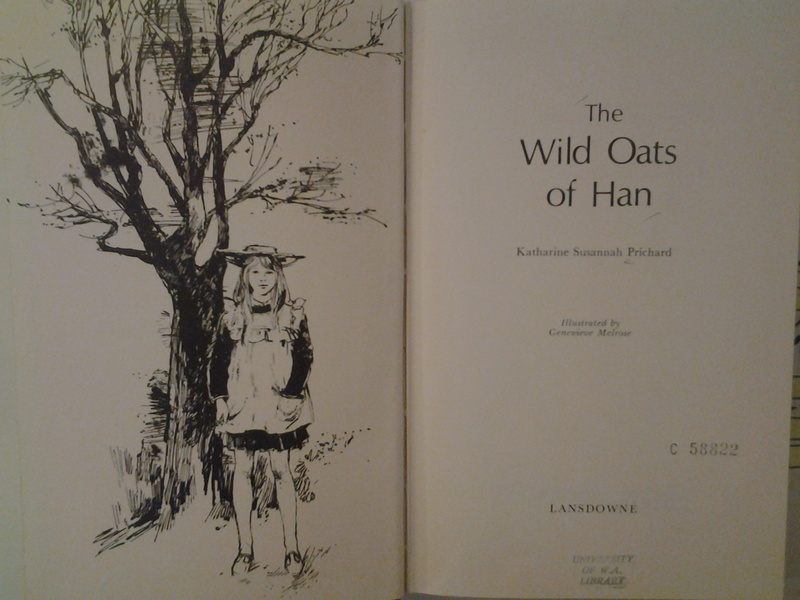 The Wild Oats of Han wasn’t published until 1928, but it was actually written in 1908, meaning that perhaps I should have it read it first; I’m reading it second. Its genre is complicated, too. It’s presented as a children’s novel, but (my 1968 edition at least) is introduced with a note from KSP saying it ‘is truly, really story’, an idiosyncratic way to say it really happened. It is perhaps a memoir of childhood written in the form of fiction. Regardless, it is beautiful. A children’s novel would require that there really be a human skeleton to discover at the bottom of the cave, or at least that some great adventure occur there. Yet Wild Oats evokes the gap between our childhood expectations of adventure gained from stories, and the reality that adventure is more a state of mind. Sitting on my shelf at home is a book, bought at a booksale two or three years ago, I am looking forward to one day reading: ‘The Pleasure of Ruins’. We are staying in a medieval apartment a few hundred metres from ancient ruins of Rome, and we have spent today looking at them. We saw great marble pillars fashioned at the time of Christ, inscriptions which have lasted centuries, the skeletal remains of the grandeur of an empire, the bricks and broken stones of it. As a child, I thought I was fascinated by archaeology, but more than that I was fascinated by ruins. Today I realised the photos in books about ruins present an idyll which is not otainable in the real world. The viewer of ruins is an explorer cutting through the overgrown forest to come across the ruins, the first to lay eyes on them for centuries. From a perfect angle, in beautiful light, the ruins shimmer and fill the viewer with a kind of longing which is hard to explain. The idyll of ruins is the quester contemplating the fate of Ozymandius in solitude and silence. 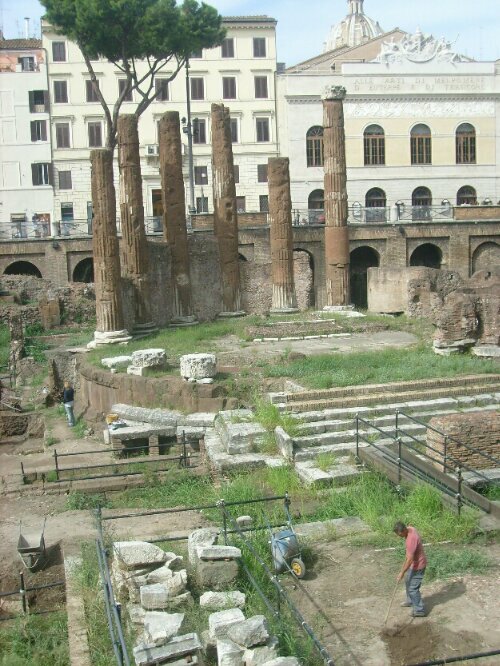 The reality of Rome’s ruins is the viewer in a sea of tourists, all straining to have their ruins experience, or at least a good photo of them. The reality is iron bars and fences and signs and relentless sellers of novelty toys and souvenirs. I had my moments of contemplation jostling among the tourists, my moments of connection to the past. In fact, it was an overwhelming dose of ruins – it seems too much for one person to be allowed to experience in one day. Wasn’t it the Romantic period when the beauty of ruins was recognised? (I will find out for sure when I finally read that book which awaits on my shelf back home.) Faux ruins were created, and others ‘improved’ to make them more picturesque. It is an instinct I fully understand. I hope they do not attempt to restore too many of the grand crumbling monuments and buildings I saw today – it is more poignant to see them as time has rendered them. Recover and preserve, but not to make them shiny and new. Leave the weeds growing out of the old bricks. Leave them with their sense of centuries which we cannot have ourselves. In 1987 I was six and obsessed with archaeology. I created a kingdom in the front yard, burying clay mummies wrapped in cloth. I also wanted to find the present again in the future, and so I wrote the date in texta on pieces of paper and buried these. They did not last so well, but I am curious as to my instinct and my hope. Was I imagining that I was preserving that particular day by the act? Was I imagining that I was creating history or creating archaeology? Perhaps, perhaps. I also went looking through the old newspapers in the woodbox. This was almost a room, a large space next to the woodfire. The old newspapers were piled in there. I always wished they were older than they were. What if I could go back to before I was born? Would I be into history then? Perhaps the milieu fostered these obsessions. Between 1988 and 1990, my primary school was caught up in an atmosphere of commemoration. For the Bicentennial we all received two medallions, an amazing treasure to seven year olds. The history of the school was being written, just as our new building was rising up. When it came out, I read it quite obsessively, the story of these people now old or dead who once walked this same ground. And then there was the time capsule, the ultimate expression of my obsessions. To be opened at the centenary of the school in 2013, it was an enchanted project. I remember the pressure of writing something that would sum up my life so far, giving an insight to my future self and the future world of what it had meant to go to Allanson Primary in 1990. I think Ms Leitch warned us to make sure we wrote in 2H pencil so that our words would not be lost to the future. In my memory, I wrote twenty or thirty pages for that time capsule; I felt embarrassed afterward for oversharing, including a list of every book I could remember reading. I included The Complete Work of Shakespeare when all I had done was fail at an attempt to read the opening pages of The Tempest when I was home sick from school. (My secret shame, that twenty-three years later I still find Shakespeare hard to understand.) Cheater! I wanted to be better than I was; a brilliant nine year old would be reading Shakespeare. I have often wondered of the other books on the list, the ones I actually read and have now forgotten. To read that precious list again would be to rediscover a large chunk of my life. The year 2013 seemed so far away it would never come; I would be thirty-two! I have thought of the digging up of the time capsule quite often since it was buried. It was one of the few future events already set down, a precise date decreed on the plaque above the water fountain. Maybe whoever made these decisions should not have buried the capsule below a water fountain. I couldn’t quite believe it when the time-capsule came up full of water, our packet of stories turned into black compost. When I was nine, I still believed the grown ups wouldn’t let that happen. The fiction shelves of Allanson Primary’s library took up one wall of the year 6/7 classroom. I don’t remember new books being added, but there must have been some. There were certainly never any books weeded in my years at school; if a book was in the library, you could count on it staying there. I was obsessed with Ancient Egypt from Year 1 to Year 3, and toward the end of this, a kind girl who liked me (I, too embarrassed, shrunk away) came up to me during library time with a book I hadn’t noticed before. It had a boy lying between the legs of the Sphinx. My momentary excitement was dulled when I realised it was a novel with nothing to do with Egypt; it was set in London, and the boy was found between the legs of the replica Sphinx. I cannot remember if I even took it out, let alone whether I read it – and yet I vividly remember the girl showing me the book . For me, it’s the books which I half remember, the ones I can’t go back to because I can’t remember the title or even the author, which have a hold on me, ghosts on the edge of memory. The few favourite childhood books which survived household purges and I still own are precious, but do not haunt. But this time I found a ghost, found it in an opshop on Saturday, for 50c, the same edition as the one from my childhood (there are six cover variations floating around the web, none of them this one). 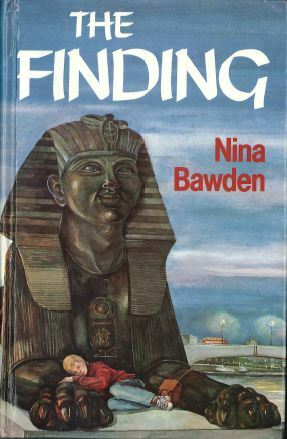 Its title returned to me when I saw it: The Finding by Nina Bawden. It was a withdrawn library book, from another public primary school, with a borrowing card stamped with dates around the time I borrowed it. I remember liking the cover, but now the Sphinx looks like he’s alive and it just looks so… earnest. On the day of his Finding, the mist lay on the river; a soft, white vapour drifting on the brown Thames, lazily stirred by the slow tide of the water into smoky tendrils and curls. But it gets much better after this, with the strange appearance of a Pentecostal tent meeting catching me offguard. I never knew anything about Nina Bawden as a child; she occupied a good section of shelf in the library, and in that sense seemed familar but we didn’t know if these authors on the shelves were alive or dead. Born in 1925, Bawden is still alive even today, but her husband died in a train crash early this century. As a child, one of my prized books was a book of baby names and their meanings. Not because I was planning names for my own children, but because I found it fascinating to discover what people’s names ‘really meant’. I thought it gave me insight into their true character. It also gave me a certain type of power, coming to school and announcing to other children what their names meant. My name is of Hebrew origin and means ‘Gift of God’; I tried to read as much as I could into that. I told James at school he had a very bad name, as his name means ‘Deceiver’. I wondered how anyone could call their child James, knowing this. And then there was Matthew C., whose name was Greek for ‘Gift of God’. I always wanted to be his best friend, and I thought this linked us in some special way. I told him this theory, but he was not entirely convinced. When he moved to Iceland, he didn’t reply to the letter I sent him. Perhaps I have disabused myself of some of the primitive notions I had about names as a child, but not entirely. Instinctually, I still feel that other ‘Nathans’ should (a) be friendly to me and (b) have some trait of Nathanness to them. Time has proven neither of these things to be true. Just as important as the ‘meaning’ of names has been the antecedents for names. I have always loved the tension present in my given names – Nathan David – from the Old Testament figures with those names. Nathan is the brave prophet who rebuked the poet king for adultery and murder. David is my father’s name; that irony interests me too. ‘Nathan’ used to be a fairly rare given name, of which I was very proud. ‘Hobby’ is uncommon too, and it was strange when another family of Hobbys moved to our country town when I was eleven. We didn’t think they were related; years later we discovered they were second cousins, separated from our awareness by family secrets. One of these Hobbys was called Joshua, and was about the same age as my brother Joshua. I didn’t know what to make of this idea – would it be like having a twin brother to have someone with the same name? Or did it make a person un-unique, did it compromise their specialness, their distinctiveness in the world? I leaned toward the latter interpretation, and thought it a terrible cruelty to be a Smith, or even worse a John Smith. In the year below me at high school, there were two Laura Smiths. Different years were never known beyond vague rumours, and it took me a long time to work out they were talking about two different Laura Smiths. One of them I knew by sight; the other I didn’t. A year after I graduated, one of them died in a car accident. I wondered if it was the one I knew by sight, or the one I didn’t, and tried not to think of it as sadder if it was the one I knew by sight. I wondered what the surviving Laura felt, if it seemed a close call. And then, finally, last year I met, in a manner of speaking, the only other Nathan Hobby I know of in the world. I found him on facebook. He’s younger than me and into football, from what I can gather about him. I thought there would have to be something essentially similar about us. But of course, there didn’t have to be. I still get a shock on my facebook feed when I read statements like ‘Nathan Hobby is no longer in a relationship’. But then perhaps the more remarkable twin, an almost Borgesian one, is my literary twin, Nathaniel Hobbie. When I was working in a public library in 2004, his book arrived about the same time as my book came out. It was called ‘Priscilla and the Pink Planet’ and it’s about a little girl obsessed with pink. His career has been more successful than mine so far; he’s followed up with four other books about Priscilla. It sounds like a Vonnegutian alter ego for me; I even started a novel called Lazarus the Pacifist Superhero with Nathaniel Hobbie as the main character. It makes it seem there must be some power to names and that out in the world are variations on each person. Do you have a twin out there in the world?